The Chic Leopard: There's a JEAN-IE ! 3 wishes for Leopard Print ! There's a JEAN-IE ! 3 wishes for Leopard Print ! Question: What's probably the one clothing item that everyone will buy in their lifetime? Answer: A pair of jeans. Okay, underwear and socks are good answers too! But for now, we will talk about jeans. Every woman searches for the perfect pair and whether they will admit it or not, so do men. 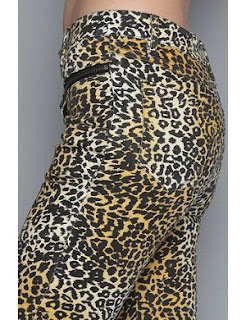 Here are a few leopard print jeans I thought the true addicts might like. Peep the name of this post. When you see a JEAN-IE, they are to grant you THREE wishes. Here are three pairs of jeans you should wish for. The first pair (wish # 1) is made by Kill City and can be found at http://www.karmaloop.com/ ! This second pair (wish # 2) are made by True Religion and can be found at http://www.6pm.com/ ! The third pair (wish # 3) are by Play Me Jeans. Click on the link beneath the images to go to the site for purchasing. People always have such a hard time picking the three wishes. I've managed to do it right here in 12 seconds flat. That's all it took for me to fall in love with these three pairs of jeans ! Yeah I love the first ones and sometimes I have to put myself on a leopard print diet cause I am borderline excessive with the things I own in this print. I really love those jeans! Long Live the Legs !